Leading congregations forward into significant, proactive, mission-congruent change is at the heart of effective pastoral and lay ministry in this Postmodern Era. We long for the day when our churches are agile and nimble, able to adjust quickly to contextual circumstances, while remaining faithful to the gospel. We want to lead congregations toward relevance in a cultural context of indifference. Our congregations themselves want to adapt to the world in which we find ourselves, extending Christ’s love while being authentic and genuine participants in God’s movement in our world. Yet, when it comes to actual change, the church does not go their quickly or easily. Leaders often underestimate the resistance to change in church systems. “A good rule of thumb in a major change effort: never underestimate the magnitude of the forces that reinforce complacency and that help maintain the status quo.” (John Kotter, Leading Change) There are so many clergy and church leaders who scratch their heads, wondering why their change effort was not received with open arms. Clearly the readiness of a church when it comes to change directly influences the success of the change effort. Farming Church adopts the often-used farming metaphor of Jesus in the gospels encouraging cultivation to guide us into intentional, adaptive change. What leaders are doing long before the change is introduced is nearly determinative of how well the change itself will go. 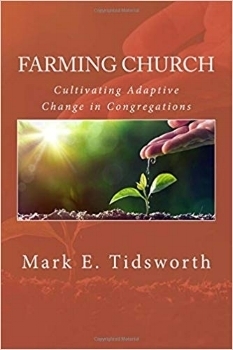 Farming Church describes the seven key cultivations for preparing the growing environment (congregation) for increased adaptive capacity. How do we know how ready our church is when it comes to for adaptive change? Perhaps we intuitively have a sense of our Readiness Quotient, yet it’s challenging to gain an accurate assessment. This is the purpose of the Readiness Indicator. There is a paper copy near the end of each Farming Church book. The online version tends to be more accessible and useful when it comes to involving participants. This Readiness Indicator is available to any church, regardless of participation Pinnacle’s Farming Church Initiative. WHAT’S INVOLVED IN THIS Farming Church INITIATIVE FOR CHURCH TRANSFORMATION? When ordering 5 or more copies, contact us for a reduced cost. When ordering fewer than 5 copies, Amazon is the best approach. We are frequent presenters at various kinds of events for those interested in cultivating adaptive change in churches. From a two-hour presentation up to a three day training event, our formats are flexible for fitting with your training, learning, or presentation needs. Contact us to explore training events or keynote presentations.